Robert Lustig Website | Promoting global metabolic health and nutrition. is Professor emeritus of Pediatrics, Division of Endocrinology at the University of California, San Francisco (UCSF). He specializes in the field of neuroendocrinology, with an emphasis on the regulation of energy balance by the central nervous system. His research and clinical practice has focused on childhood obesity and diabetes. Dr. Lustig holds a Bachelor’s in Science from MIT, a Doctorate in Medicine from Cornell University. Medical College, and a Master’s of Studies in Law from U.C. Hastings College of the Law. 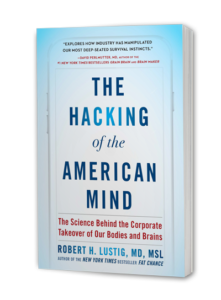 Dr. Lustig’s new book is The Hacking of the American Mind. There is nothing that will improve your health, your well-being, your achievement, your sense of accomplishment, your sense of community, and the health and happiness of your family as much as cooking yourself and enjoying a meal with others. What’s the difference between marketing and propaganda? The food industry has propagandized the last 40 years of nutritional information. They got rich, and we got sick. Time to embrace the real science of real food.